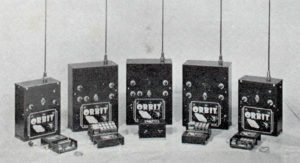 From 1947 to 1978 local enthusiasts flew control-line, free-flight, and from 1950, radio controlled model aircraft. They flew from Wincanton Racecourse, from local fields and from the old Royal Navy Airfield at Henstridge. 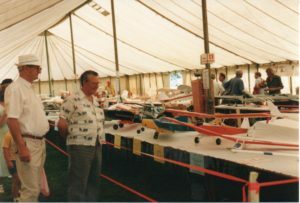 The Wincanton Falcons Club was formed in 1978 to bring together the various groups of modelers who were operating mainly on the Racecourse at that time, and to enable those building and flying scale models to do so competitively within the Wessex Scale League. In 2018 the club celebrated its 40th anniversary. The Club is affiliated to the British Model Flying Association (BMFA). This is the National body representing the model flying hobby at Government level and ensures that Civil Aviation Authority requirements are met. All members are insured through the BMFA for Third Party damage. The Club has a training scheme with training aircraft equipped with dual control. There are Instructors and Examiners which means that Members can learn to fly initially without necessarily going to the expense of buying their own model and radio equipment. Eric Poole and Glynn Wilkins, two of the founders of the club, at the Brains Farm Model Show in 1990. The flying site is in open country, about a mile east of Templecombe on the road to Buckhorn Weston, and is available all the year round. There is a wide range of interests and models within the Club including gliders, jets, helicopters, quads, First Person View, electric, Glo-plug and petrol engines. Also scale, aerobatic and sport aircraft.